EDITOR'S NOTE: This is a weekly look at developments in the South China Sea, the location of several territorial conflicts in the region. A senior U.S. official says the presence of large numbers of Chinese vessels near islands and islets occupied by the Philippines is "a concern." The Philippine government protested the Chinese ship movements Thursday after its military monitored more than 200 Chinese vessels from January to March in a disputed area named Sandy Cay, which is near the Philippine-occupied island of Pag-asa. Asked about the situation while on a visit to Bangkok, Joseph Felter, deputy assistant secretary of defense for South and Southeast Asia, told reporters Friday that the U.S. is troubled "by any aggressive activity by any country in the South China Sea, in this case China. We see that as of concern." "In this case, China's activities are of concern. It seems to be somewhat aggressive and provocative and we feel that they're unnecessary and unwarranted," said Felter, who was in Thailand to attend a meeting of defense officials of the Association of Southeast Asian Nations, or ASEAN. The Philippines regards a chain of islands and islets, nine of which it occupies, in the Spratly archipelago in the South China Sea as a municipality it calls Kalayaan under its western province of Palawan. That claim conflicts with the larger territorial claims of China, Vietnam, and three other governments in a long-simmering Asian dispute. Philippine President Rodrigo Duterte says he has few options other than to order troops to "prepare for suicide missions" if a Philippine-occupied island comes under threat from China. Duterte reminded China in a speech Thursday night of its closer ties with the Philippines under his leadership, but said if an island occupied by Filipinos in the disputed waters is threatened, "things would be different." 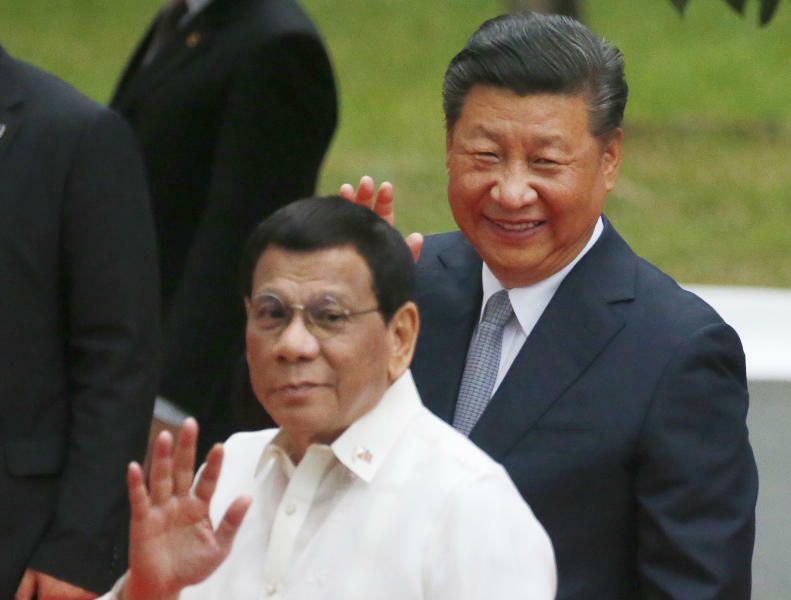 Duterte has adopted a non-confrontational approach in territorial spats with Beijing while seeking Chinese infrastructure funds, trade and investment. He has often lashed out at the security policies of the United States, a treaty ally, while praising China and Russia. The Philippine military has monitored Chinese vessels in a disputed area named Sandy Cay near the island Filipinos call Pag-asa. "I'm trying to tell China, Pag-asa is ours ... so let us be friends but do not touch Pag-asa Island and the rest. Otherwise, things would be different," Duterte said. "This is not a warning, this is just a word of advice to my friends, because China is our friend." "I will not plead or beg, but I'm just telling you (to) lay off (of) Pag-asa because I have soldiers there," he said. "If you touch it, that's another story. Then I will tell my soldiers 'prepare for suicide missions.'" The Philippine government has protested the presence of large numbers of Chinese vessels near islands and islets occupied by the Philippines as illegal and vowed to take "appropriate action." The Department of Foreign Affairs on Thursday issued the rare public rebuke of the Chinese presence after the Philippine military monitored more than 200 Chinese vessels from January to March in a disputed area named Sandy Cay near a Philippine-occupied island called Pag-asa by Filipinos. The statement said the presence of the Chinese vessels there was illegal. "Such actions are a clear violation of Philippine sovereignty, sovereign rights and jurisdiction as defined under international law." The department said it has lodged diplomatic protests and raised concerns in meetings with Chinese officials, and that the presence of Chinese military, fishing or other vessels in the area would "continue to be the subject of appropriate action by the Philippines." "We call on the Chinese government to adhere to this consensus reached at the highest levels, down to its agencies and its military," the Philippine foreign affairs department said. Associated Press journalists Jim Gomez and Joeal Calupitan contributed to this report from Manila, Philippines.